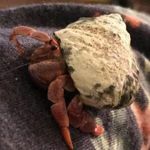 I'm not sure if this is where my issue should go, but about 2 weeks ago, I caught one of my hermit crabs (Apollo) climbing out of the tank by using the heating pad cable to reach the top. He's small enough to fit through the little opening I have so the cable can go through. It was late at night so I just put him back on the ground and moved the heating pad. 2 days ago, I noticed he wasn't on the surface, so I assumed he was just under the sand. I've been on the road for about a day and I got a message from my sister who's been filling their food/water dishes that she found the hermit crab outside in the hallway. I'm on my way home now and I am wondering how should I position the heat pad so they can't reach the cable? I've considered just getting a heat lamp but I've heard heat lamps make it difficult to control the temperature so I am hesitant to buy one. Advice is much appreciated! I’ve had purple pincher hermit crabs (Zeus, Poseidon, Hades, Hermes, Apollo, and Hephaestus) since May 31st, 2017. Kinda new at hermit crab care, but I’m learning new things everyday! Do you have your heating pad on the inside of the cage? The heating pad should be on the outside of the tank against the rear wall. Depending on the type of heating pad you have it can be secured with duct tape and some such as ZooMeds have sticky backs to secure it. Here is a guide to adding heaters to the tank.